Don’t Wish Things To Be Different??!! Looking back, I remember how angry I was. It wasn’t fair. I’d stopped smoking 50 years before the diagnosis and since that time I’d been a yoga practitioner and, for many years, a long distance runner. You get the picture. I took good care of my body. Fitness was important to me. I searched for reasons. Maybe it was caused by all the stress I’d been under in 2015 and 2016. After all, I’d packed up the house I’d lived in for 43 years and moved to a new city. Then I’d left my marriage of almost 55 years to live alone with Sammy the Poodle in a two-bedroom apartment. I’d never lived alone. Freedom brought with it all the stressors of a broken relationship and the need to manage life’s tasks alone. Friends tried to comfort me by pointing out that, after all, if you live long enough, you’re bound to get some sort of illness. COPD wasn’t so bad. Lots of people have it and live normal lives. My response? That may be true for other people, but not for ME. I’m healthy. I work out. I do yoga. I eat right. I don’t get sick. Winter came and things got worse. It turns out that COPD is exacerbated by cold weather. I was miserable. Then, one bright, beautiful winter day in the dog park, my face got very cold. I’d forgotten I had cold urticaria, an allergy to cold that causes my body’s histamine to swell all the tissues in my body. Recent winters I’d avoided the face-swelling, sick-to-my-stomach feeling of this allergic reaction to cold. I’d almost forgotten I had the condition. Now I had both cold urticaria and COPD. I was feeling sorry for myself. My meditation practice taunted me. DON’T WISH THINGS TO BE DIFFERENT. That was a basic teaching. Under the circumstances, it was hard to watch life unfold without judging it. Nevertheless, I kept repeating don’t wish it to be different, over and over to myself. In time, I came to the conclusion that I needed to leave Canada for the winter months. I’d become a snowbird. Yes, I could do that. I’d find a warm winter home for Sammy the Poodle and me and just avoid cold weather. Fast forward to now, the summer of 2017, exactly a year after I was mourning the loss of my healthy body. How am I now? It’s summer and I’m pretty healthy. I rarely think about COPD, but I do think a lot about my solution to the problem. I’ve arranged to rent a house in the desert, a location that’s perfect for my health. Do I wish things to be different? No way! I couldn’t be happier with the way things have turned out. Imagine! If I hadn’t been diagnosed with COPD I wouldn’t be going off to a warm desert for five cold months. Here’s the plan. Sammy and I will spend the winter in Arizona. I’ve even rented a house there. I’m excited about this new chapter in my life. Do I wish things to be different? No way! If it weren’t for my lung condition I’d be stuck here in the ice and snow. Sounds simple? Maybe simplistic? All you have to do is maintain your determination to be happy regardless of what happens. That’s what spiritual guide Michael Singer tells us. Okay, I thought, I’ll give it a try. I’ll experiment with a new way of being. For thirty years as a psychotherapist I’ve delved into the underlying causes of human moods. Early childhood’s adverse experiences are known to be responsible for most of our anxiety and depression, as well as our inability to get what we want and need from life. Here was something totally different, a prescription for disregarding emotions and thoughts. Instead of going into the feeling state to mine its message, I was being advised to breathe deeply, relax and let go of the fear or worry disturbing my peace. It was a revolutionary way of reaching the goal of happiness. Could something so simple really work? I set out determined to test this new approach. My inner critic voice seized the opportunity to poke fun at me. Oh sure, it was saying, just decide to be happy and wipe out a lifetime of hurts and habits. Still, I was feeling pretty good. I took a deep breath and released the scolding into the atmosphere. Energy is neutral, neither good nor bad. I was releasing energy into the source of the Great Energy that connects us all. Everything went pretty well that morning as I drove around town grocery shopping and doing routine errands. When I paused too long at a red light, not realizing it had turned green, the guy behind me honked his horn and made a very rude gesture. I was about to get upset. But wait, I had a better way. I could relax, release the emotion into the universal energy and remain happy. I kept him waiting another minute while I cleared my inner messiness. It worked: for me at least. I was hopeful and surprised at the effectiveness of this new/ancient way of handling stress. Back home, I went to my computer to write about this amazing new experience. That’s when I met with an insurmountable block to my happiness. I could be happy as long as my inability to deal with technology wasn’t exposed. That was a gaping wound, one of those situations I can’t handle. My internet was not available. Something was unplugged or unpaid for. This sort of technical problem completely disarms me. I was on my own. I became so upset I began seriously questioning the wisdom of having left my marriage. Could I function without a man to deal with technical problems? There was no computer-savvy husband to turn to. I felt alone and vulnerable. As the day went on, the happiness-threatening situation grew worse. I’d just installed two portable air conditioners in my apartment. One was in the bedroom: the other in the living area. Agitated and unnerved by the internet disaster, I realized my feet were wet. What?! I looked down and saw water pooling on the living room floor. I rushed to the bedroom. Water was puddling there too. Somewhere I’d got the idea I had to buy little garden hoses to run the water resulting from cooling into white plastic basins. The trouble was, the little white basins didn’t hold enough water. I was completely unnerved. Breathe, for heavens’ sake, I told myself. Send the hysteria into the universal pool of energy. It was almost a week later that a technician came to my rescue. Guess what? I didn’t need those garden hoses. Modern air conditioners somehow turn all that water into condensation and spew it out the white tubing vented through the window to the outside. A husband would have known that. Aging and Taking Charge of Your Life: that’s the current title of my webpage. I chose those words when I was leaving my marriage of 54 ½ years. Determining my own path and living the life I wanted loomed large in my mind. Clearly I was determined to take charge of my life. A year and a half has gone by since I struck out on my own. I’ve faced many challenges I’d never have tackled as a married woman. Deciding where to live and signing a lease, negotiating a loan for a new car, dealing with the bank and making major decisions. All of these were shared tasks when I was married. As a single person, there is no partner to help carry out the chores and decisions of normal adult life. Interestingly, the title Aging and Staying in Charge of My Life no longer feels meaningful. I’ve changed. That’s why I need a new title. I am no longer of the opinion that taking charge is right for me. In fact, my current life path teaches me not to wish things were different from what they are. “Things are what they are,” goes the wisdom. We are part of an energy that pervades all beings and all life. It’s not our place to decide what should happen. Trying to order our world so as not to stir our innate fear of living makes no sense. What we need to change is what’s inside us: and this happens by relaxing, not by striving. My awakened awareness came last winter when I visited San Miguel de Allende in Mexico. Naturally, I headed for the local yoga centre where they were offering meditation classes. I signed up and headed for a comfortable couch in a circle of a dozen other meditators. The particular practice was called Non-Dual Meditation. Listening to the lectures, I found myself taken back to a very old place where I’d been when I was in my 30’s and Swami Radha was my spiritual teacher. These were her teachings, but this time I was listening with the ears, heart and life experience of an older woman. This was exciting! Non-Dual Meditation reflects the findings of Quantum Physics. (Nothing is fixed and solid, including us humans. We are all connected through the same universal energy.) Insights and ideas scrambled furiously in my brain and in my memory. My fellow Unitarian Universalists refer to “the interconnectedness” of all beings. Eugene Gendlin describes Focusing’s felt sense as: Your physically felt body is part of a gigantic system of here and other places, now and other times, you and other people – in fact the whole universe. This sense of being bodily alive in a vast system is your body as it is felt from the inside. All my beliefs, understandings and practices were coming together in this whole new path. I was excited! 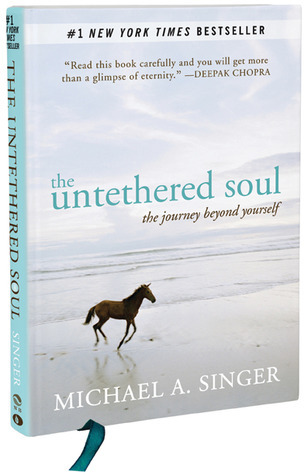 Since returning home to Canada, The Untethered Soul: the journey beyond yourself by Michael A. Singer has guided me in this new stage of my journey. It is a straight forward guide to living life more fully through mindfulness and letting go of self-consciousness. I’ll tell you more about this in future posts. Meanwhile, I’ll make you an offer. Whoever sends me the winning title for my webpage will receive – free – a copy of this remarkable book. I’m looking forward to your suggestions and, as always your comments on what I’ve written.